Well three points certainly put a different complexion on things. 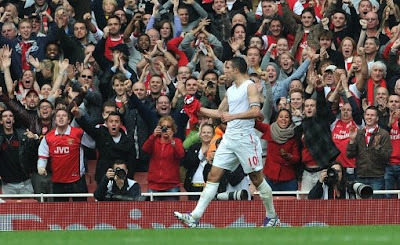 And we've really got only one player who can be thanked for bagging the win, man of the moment captain Robin van Persie. When he was working on his programme notes for yesterday's game, I'm sure he must have realised that by stating his committment to the club everyone watching the game would have been looking for those words to be translated into a performance on the pitch. And if you needed signs RVP wants to do well with this Arsenal team you didn't have to wait for long. Within 29 seconds he'd given us the lead after good build up play from Tomas Rosicky and Gervinho. All the Dutchman needed to do was place his shot after allowing the ball to cross his body on to his right foot and his quick decision to shoot caught Simon Mignolet off guard and van Persie's strike found the back of the net. A new record - Arsenal's fastest ever Premier League goal. The captain should have had a second had his chip over Mignolet not hit the wrong side of the post and bounced out of the goal rather than into it. The striker is really getting to the peak of his game. We were playing some good football but then Mikel Arteta was penalised for a hand ball and the free kick 25 yards out was perfect for ex-Arsenal player Sebastian Larsson who took a superb free-kick which beat Wojciech Szczesny. Moments later it was Szczesny we had to thank for keeping us on level terms with a fantastic save from Lee Cattermole from four yards out. It is become a bit of a habit for the Poland international to make a superb save which keeps the Gunners in the game and again Szczesny proved he's more than up to the task of being Arsenal's number one. It seemed we needed half time to rebalance the ship. But despite some good efforts we couldn't break through again. Andrey Arshavin's introduction seemed to give us new impetus. His mazy dribble through several Sunderland players had the North Bank on its feet. And the Russian did everything but put the ball in the back of the net. His shot going wide of Mignolet's far post. It was captain marvel van Persie though who took the bull by the horns as the clock was ticking down. Having watched Theo Walcott, Arteta and Andre Santos put free kicks over the bar, van Persie decided he was going to take this one, after being fouled by Wes Brown on the edge of the area. It was perfect distance and position for the captain on his favoured left foot. He struck it perfectly to beat Mignolet at his near post, causing wild celebrations around the ground. Unfortunately Robin decided to take his shirt off in celebrating his goal earning himself a booking - a silly rule we all must agree - but a pointless booking to receive. We took all three points and now move to tenth in the table, six points behind fourth placed Newcastle. "We have now won five home games on the trot. If we can put another two or three results together it will help confidence because you can feel that the attitude and spirit of the team is great. "Even at half time we had a good response. The motivation is there and the quality too so we should eventually get there." "He scored two goals. I think you have to analyse the game a little bit to see how important he is. The first goal was a good display of the team and the second chance he made the difference just because of his skill, which was exceptional." Van Persie is having an excellent 2011. He's scored 28 in 34 games, a record I don't think which can be matched elsewhere. If only we could get him to sit down and discuss a new contract! "Gibbs has an inflammation of his stomach muscles. Ramsey has a small chance to be in the squad, he had fatigue of his hamstring but it is a very, very minor one. I wanted to give him a breather. It would have been a gamble to play." Hopefully both will take part because we're a better side when they're in the team than out of it. A win certainly puts a better perspective on going back to work this morning. So have yourself a fantastic Monday.